After that peeping tom moment in Charlie's Hero--the peeping toms being Josh Campbell and Charlie Matthews--we find out what exactly led to said moment between Andrew Campbell and Tanner McKenzie, former best friends who had feelings for one another but when life and responsibility grabbed Drew by the shoulders, he ended up pushing Tanner away and Tanner ran as far as he could from the only boy he had ever loved. 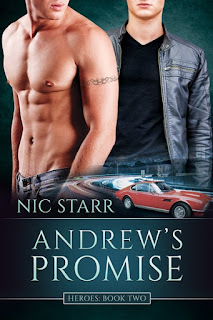 You do NOT have to read the Charlie's Hero in order to enjoy Andrew's Promise because even if there is an overlap and there are shared characters, you'll be able to absolutely get the most out of this second chance romance slash second Heroes book from Nic Starr, which, after having read all three currently available books in the series, is my favorite. Andrew Campbell and Tanner McKenzie are the best of friends, but there's been an underlying attraction that's been building for a while now. Maybe they can explore it when they start their road trip together. But then life deals a devastating blow Drew's way--his father suddenly passes away, leaving Drew the sole guardian to his younger brother Josh. Everything comes second to what he has to do to make sure Josh is okay and cared for--and that includes Tanner. Drew asks for time and Tanner agrees, but neither man thought it would take more than a decade for Tanner to find his way back to Halls Ridge. Now thirty-three and thirty-two, respectively, Drew and Tanner have changed, but maybe the feelings they once shared could prove the be one thing that hasn't changed. Purchase Andrew's Promise on Dreamspinner Press | Amazon | B&N | iBooks | Kobo.